Dmitri Danish - Paintings of Venice, Italy by the very talented Cityscape Artist from the Ukraine, Dmitri Danish, stunning giclee canvas limited editions coming soon to Ashley's Art Gallery. Dimitri Danish was born in the year 1966 in Kharkiv, Ukraine. Dimitri Danish, a young Ukrainian artist's favorite genre is cityscapes. Starting as a child, he painted cities as he imagined them from books, cities that he heard about on the radio or in people's conversations and cities that he saw printed on postage stamps. Since the fall of the Soviet Union, Danish has travelled throughout Europe, visiting the cities of his imagination. In 1986 Dmitri Danish graduated from college and began to teach art. He quickly realized that teaching art was not his ideal career - he wanted to express himself through art, not teach others. Dmitri Danish went into the army for three years and as soon as he returned, he immediately entered into the department of Fine Art at the Kharkiv States Polytechnic University. He began to paint for his livelihood in the year 2000. The Kharkiv State Museum of Fine Art conducted a solo exhibition of Danish's works called "Cities and Mountains" and purchased three of his paintings that are part of their permanent collection. During 2000-2001, the New Jersey Museum of Modern Art also purchased three of Dmitri Danish's works and in 2003 the Ukrainian government purchased a painting and presented it to the outgoing ambassador of the United States to Ukraine. In 2003, the Ukrainian government presented the outgoing American ambassador with a Dmitri Danish cityscape. And this year he makes his first trip to the United Statethe fall of the Soviet Union, Danish has travelled throughout Europe, visiting the cities of his imagination. 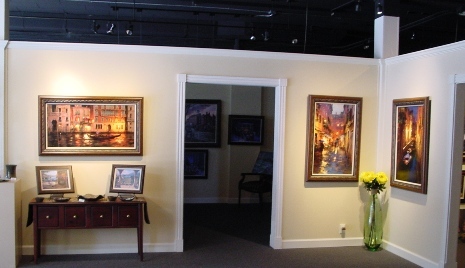 Some of the Dmitri Danish art at Ashley's Art Gallery.